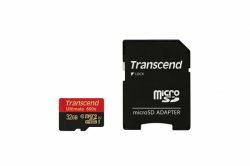 Designed to enhance your smartphone and tablet user experience, Transcend microSDHC UHS-I memory cards feature the Ultra High Speed Class 1 specification. Utilizing this next-generation technology, these cards ensure the best possible performance when running memory-intensive mobile apps and games, as well as smooth Full HD video recording and seamless playback. Additionally, the top-tier MLC NAND flash chips inside provide consistent long-life durability and endurance.